Anu Ayanleke is a seasoned professional with over eight years working experience in banking, office administration and human resources. In 2016, she received a Master of Business Administration degree with specialization in General Management from the University of Lagos, Nigeria. Also, she has a Diploma in Human Resource Management from the Chartered Institute of Personnel Management, Nigeria, and a Bachelor of Science degree in International Law and Diplomacy from Babcock University, Nigeria. She is currently a Registered Professional Recruiter (RPR) in Canada, and an associate member of the Chartered Professionals in Human Resources (CPHR), Alberta. The NRLC is proud to welcome Anu as a member of our team, and we are confident that she will benefit our educational community as we move forward to support you, our educational stakeholders. This is a full time position (1.0 FTE) with duties commencing January 7, 2019 and ending June 28, 2019; with the possibility of extension. The Executive Assistant, under the direction of the Executive Director, is responsible for the efficient day-to-day operation of the office and supporting the work of the Executive Director and the Board. The Executive Assistant must possess the ability to adapt to new technology and the ability to deal with people sensitively, tactfully, diplomatically, and professionally. The Executive Assistant is responsible for the office operations, under the direction and supervision of the Executive Director. Degree or diploma in administration, business, or a related field. Proficiency with technology and web-based platforms. Accounting and financial management skills are an asset. Provide daily administrative supports to the Executive Director to ensure effective operation of the consortium. Provide support to contracted and seconded staff as required. Management of the office including receptionist duties, organization of materials, receive, review and distribute incoming mail, management of paper and electronic documents and files, as well as resource and supply purchases. Management and coordination of office software, technology support and maintenance with external vendors (i.e., website provider). Develop and deliver marketing strategies for professional learning opportunities and projects, including responsibility of continual updates to NRLC website and social media accounts. Logistical planning for and assisting with meetings, including minute taking. contact suitable presenters, organize learning opportunities/programs and negotiate contracts on an as-needed basis. create and manage speaker/facilitator contracts and/or agreements and maintain ongoing communication with speakers/facilitators as liaison with the consortium. coordinate all aspects of a learning opportunity event from initial data base set-up to final participant reports, including hosting of events. manage and maintain reporting, including, providing program data analysis and reporting of professional learning opportunities. Manage and maintain on-line payment system, (ie: credit card processing). Provide public relations service to partners, stakeholders, presenters, and others as directed by the Executive Director. To accept other delegated responsibilities at the discretion of the Executive Director. Please submit a resume, with references, and letter of application that demonstrates the extent to which your education and experiences fulfills the knowledge, skills and attributes for this position. Deadline for receipt of submissions is December 12, 2018. Northwest Regional Learning Consortium (NRLC) is one of 7 consortia in Alberta established to support regional and provincial professional development needs for all those who influence student learning. NRLC is governed by six (6) education stakeholders (CASS, ASCA, ASBA, ASBOA, Faculty of Education-University of Alberta, and Alberta Education), and is responsive to the needs of school authorities in its role of creating professional learning opportunities in an ongoing, coordinated and cost effective manner. Our mission is “Partners in Adult Learning for Students’ Sake” and we provide a wide range of learning opportunities for school jurisdictions, private, charter and band-operated schools in Northern Alberta. NRLC operates under an Agent Board Agreement with the Grande Prairie Public School District. Strategically blending online content with a classroom experience, Flex, our blended eLearning delivery platform, allows training to be more effective and efficient. Flex is the culmination of our eLearning initiatives and gives you the ability to use whatever time you have available in a way that best fits you and your organization. Providing flexible learning options for both Certified Instructors and participants, Flex empowers individuals by allowing them to choose when to learn—it doesn’t matter what time it is. If you’re a night owl or an early bird, you just need to log on and start learning. Our Nonviolent Crisis Intervention® training program with Flex saves you one day away from your organization. You can obtain, recertify, or upgrade your CPI certification in three days rather than four. If you already have upgraded your certification and are due to renew, you need to attend just the first day of the program. After registering, you’ll receive instructions for taking the online portion of the class which is a prerequisite to the classroom portion. Your experience begins by completing the two to three hours of online learning before coming to the classroom for the days and the times listed above. To the attention of French immersion administrators and teachers - Please transfer to all interested parties. Veuillez s’il vous plaît transférer cette annonce à l’ensemble de votre personnel et à vos contacts. Inscrivez-vous dès maintenant au Symposium des Rocheuses, 22-24 août à Banff, Alberta. LA conférence pour enseignants en immersion et francophones de l'ouest canadien. Nous vous encourageons vivement à prendre connaissance de la programmation exceptionnelle qui vous est offerte. Si vous ne pouvez participer qu'à une seule conférence cette année, faites que ce soit le Symposium des Rocheuses. The Northwest Regional Learning Consortium is pleased to announce BILL SHEETS as Curriculum Facilitator. Bill officially joins our team January 29, 2018; from the Peace River School Division. He is ready to take the leap into regional Consortia curriculum support work while on secondment. We are sure he will be kept busy in northern Alberta, working closely with our esteemed partners in education. Bill has been an educator and administrator in schools in Northern Alberta for 24 years. 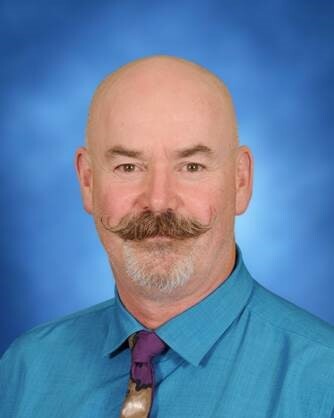 He has taught at every level from grades 1 to 12, and has 11 years experience in a variety of schools in Peace River School Division. The NRLC is glad to welcome Bill as a member of our team, and we are confident he will be great support for teachers in the area. Be sure to connect with us if you have questions or needs, and let us know how we can assist! The sessions tend to address high-level system topics and not a lot of classroom application. CTF/CTS: Professional Learning Day is a day intended to allow CTF and CTS teachers from across the region to get together and make connections with one another as well as with presenters from schools, industry and government, all focused on successful implementation of CTF/CTS programs. The theme this year is “Teachers and Students - Partners in Practice”. The CTF and CTS curricula were designed to encourage and value students to be co-designers in learning. Come and join colleagues and students in sharing ideas and approaches to support learning. "The 2 Sisters" are coming back to Alberta and Red Deer is their only stop! Registration is now open--click here! Gail Boushey and Allison Behne of The 2 Sisters Company will share with you how to create classroom routines that promote learning independence. Using the 10 Steps to Independence and the Daily 5 Literacy Structure you will gain new insights on keeping students engaged and moving forward. You will dive deep into CAFE to learn the instructional protocol that allows you to assess, differentiate instruction and effectively deliver whole group, small group or individual focused lessons. Boushey and Behne will also showcase how using a conferring notebook can help track student strengths and goals, record next steps and makes sure no students fall through the cracks. You will build your confidence and expertise in teaching students of all levels, with any curriculum, how to be independent literacy learners, and walk away with an exclusive how-to guidebook and online resources to help you implement what you learned. Join the Central Peace Early Childhood Coalition for a Parent & Cargiver Event featuring Self-Regulation. Dr Patrick Carney in Grande Prairie! 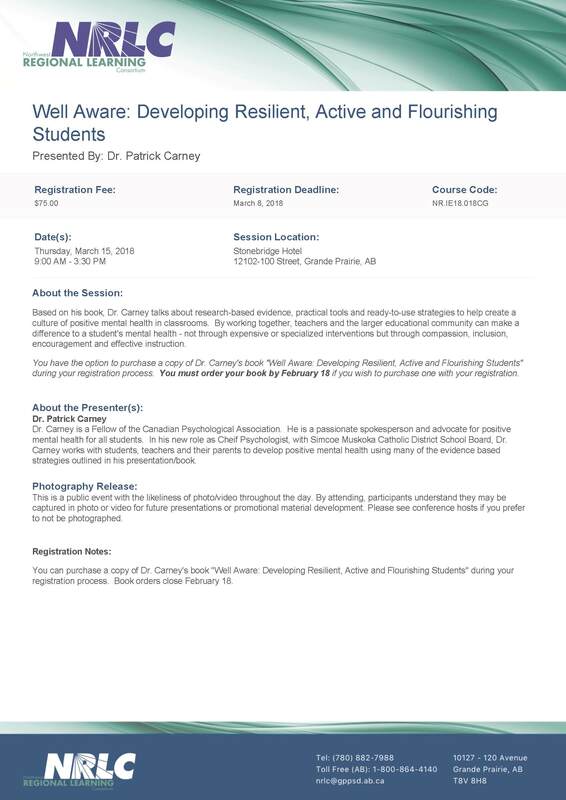 You have the option to purchase a copy of Dr. Carney's book "Well Aware: Developing Resilient, Active and Flourishing Students" during your registration process. You must order your book by February 18 if you wish to purchase one with your registration; early registration is encouraged. Dr. Carney is a Fellow of the Canadian Psychological Association. He is a passionate spokesperson and advocate for positive mental health for all students. In his new role as Cheif Psychologist, with Simcoe Muskoka Catholic District School Board, Dr. Carney works with students, teachers and their parents to develop positive mental health using many of the evidence based strategies outlined in his presentation/book. Join Ken O'Connor on tour in northern Alberta! The NRLC is hosting a workshop in Peace River in November, for both PowerSchool and Maplewood platforms. The session will begin with introductory ideas and activities to activate thinking about grading, including the Seven P’s of grading (Procedures, Policy, Practices, Purpose, Principles, Practicality and Principals/School leaders). The main section of the workshop will be the presentation and discussion of eight guidelines for grading, guidelines that will make grades accurate, meaningful, consistent and supportive of learning. Ken O'Connor has been an independent consultant on assessment and evaluation from 1996 to present. He has been a staff development presenter and facilitator on assessment, grading and reporting in 33 states and 7 provinces and 5 countries outside North America. A one year membership to thedailycafe.com is included in the cost of this workshop. Join Dr Kim Barthel in Grande Prairie for the two day professinals workshop on Autism. She will lead participants through enhanced evaluation and intervention skills in the sensory treatment of children with Autism Spectrum Disorder. Kim Barthel is a world-renowned occupational therapist and teacher, actively supporting multi-disciplinary function and healing in many cultures internationally. 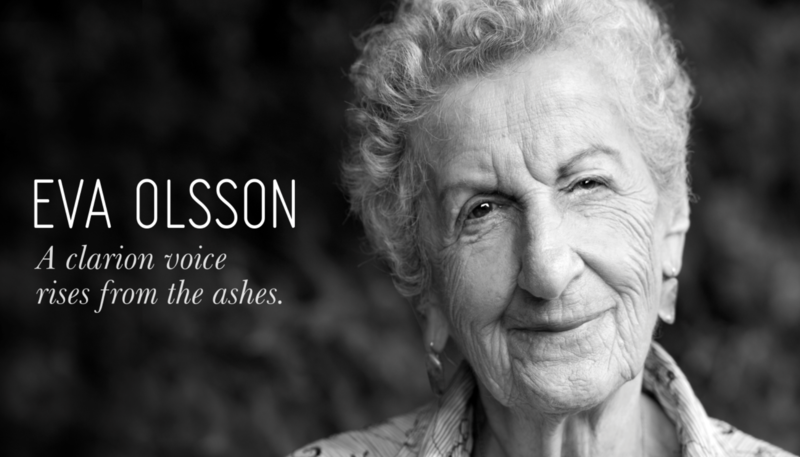 A pioneer in reinforcing the importance of relationship in therapy and education, she is known for blending cutting-edge developments in neuroscience with the art of compassionate inquiry. With 30+ years as an OT, Kim's specialties include autism, complex behaviour, sensory processing, neuro-developmental treatment, mental health, trauma-informed practice and attachment. Her mission is to support the conscious evolution of the human spirit. "A Legacy of Caring, Compassion, and Character"
Every parent, teacher, coach, student, politician, and business person alike, has a responsibility to demonstrate leadership to ensure their community is a safe, compassionate and accepting place to live in. This evening is in partnership with Peace Wapiti School Division for the Grande Prairie stop of Eva's Northern Alberta Tour. Dr Gordon Neufeld in Grande Prairie! South Peace Area Rural Kids Early Developemnt (SPARKED) is hosting a professional learning day in Grande Prairie. We all want our children and students to thrive - to become all they were meant to be. But how is this to be accomplished? What conditions are required for optimal functioning? What experiences are essential to the unfolding of human potential? Dr. Neufeld will put the pieces together to reveal rather surprising answers to this quintessential question of human development. A consciousness of the irreducible needs of young children is a much needed antidote to a society that has become outcome driven and a culture that has lost its intuitive wisdom. This is a full-time contract or secondment position (1.0 FTE) with duties commencing January 8, 2018 and ending June 30, 2018, with the possibility of extension (FTE is negotiable). Are you passionate about making a difference in education through professional learning? Do you have expertise in and knowledge of significant research and trends in education and learning? Are you searching for an opportunity that would draw upon your creativity, leadership, and instructional coaching abilities? The purpose of the Curriculum Facilitator is to give direct support to teachers and leaders during curriculum implementation, as close to the classroom as possible; enhancing their capacity to support improved student learning and success. The Curriculum Facilitator will facilitate a variety of learning opportunities designed to address priority implementation areas of focus provided by Alberta Education as well as differentiate the needs of individual school jurisdictions, and respond to the context needs of each district or authority, and the differences in stages of implementation. The successful candidate will possess experience, knowledge, and abilities in professional learning leadership, development, and delivery within the Alberta context. Deadline for receipt of submissions is October 25, 2017. As a Board we are pleased to have had the ability to choose from a competitive slate of candidates and are glad to have found such a high quality candidate to take on the professional learning torch from Karen Egge. Karen retires officially at the end of October. Please help us to welcome Sandra Ciurysek as the new Executive Director of the Northwest Regional Learning Consortium. Sandra joins our team effective September 1, 2017. Sandra is a longtime resident of the Peace Country and lives in Berwyn, Alberta. She holds a Master’s Degree in Education from University of Lethbridge and a Bachelor’s of Education Degree from the University of Alberta. Sandra has an experienced background in K-12, teacher professional development and is an advocate for lifelong learning. The NRLC is proud to welcome Sandra as a member of our team, and is confident that her leadership and expertise will benefit our educational community as we move forward with initiatives to support teachers and other educational stakeholders. This year marks the 21st year of operations for the Northwest Regional Learning Consortium! 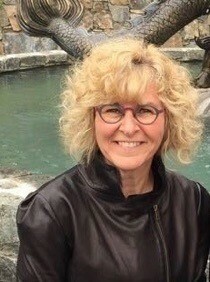 In this time we have kept the same Executive Director (Karen Egge) very busy throughout our northern zone of the province; as well as a valued contributor and lead to the picture of education services in the province of Alberta. Karen remains the main contact for programming and district support across the curriculum. This fall will bring two familiar faces back to the office from a much-needed summer break. Tammie Diesel, Executive Assistant/Systems Coordinator remains lead on financial and adminstrative management, continues to leand and assist with programming requests; as well as website lead. Jenn Labrecque, Admin/Program Assistant, remains in her position of admin and program support; as well as website setup and registration support. In case you didn't know it, the NRLC is happy top have successfully moved office locations in June! We are now comfortably part of the Grande Prairie Public School Disitrct Central Office. You will find us downstairs in the IT wing at the new address of 10127-120 Avenue. We hope you enjoy our new website and the simplified online registration process. Our team is ready to hear from and respond to the needs of educators and facilitators.